Congratulations to Carroll Elementary third grader Diego Zarzoza for winning the 2019 Sheldon ISD District Spelling Bee Thursday in the Ney Administration Boardroom. Kalani Cox, fourth grader from Carroll Elementary, placed second in the event; and Monahan Elementary fifth grader Savannah Gomez took third. Zarzoza will now represent Sheldon ISD in the 2019 Houston Public Media Spelling Bee at the Baylor College of Medicine Academy at Ryan Middle School (Houston ISD) on March 23. If, by chance, he is unable to attend the event - Cox will serve as the district's alternate. 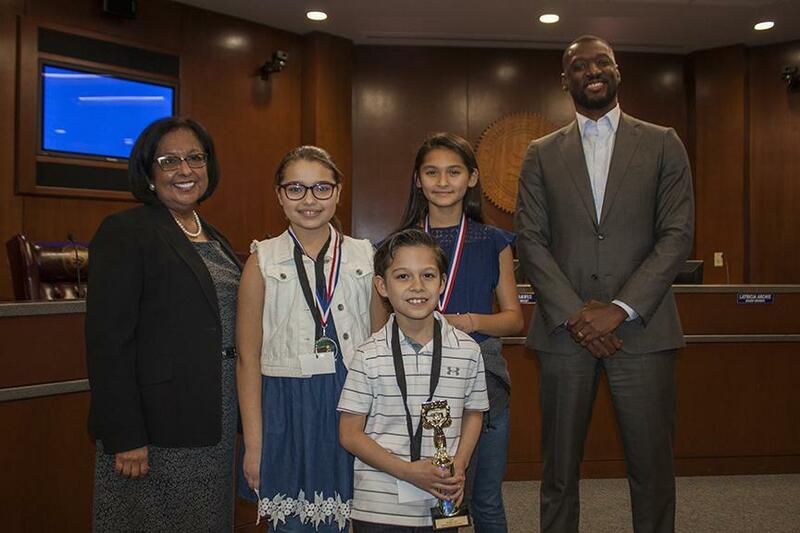 Pictured are (from left) Patsy Cavazos, Sheldon ISD Chief Academics Officer; Kalani Cox, second place finisher; Diego Zarzoza, District Spelling Bee Champion; Savannah Gomez, third place recipient; and Sheldon ISD Superintendent King Davis. Congratulations to all Spelling Bee participants!